Xiaomi announced back in December of last year that it's next flagship smartphone which is the Mi 7 will be announced at MWC 2018 but latest report has it that the announcement of the Mi 7 might be postponed while the Mi Mix 2s might be announced instead. 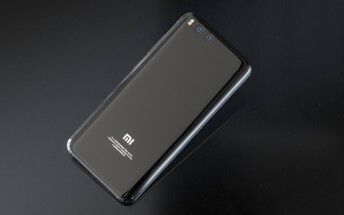 According to leaked screenshot of the Mi 7 which was posted online, the device is expected to come with a Snapdragon 845 chipset under the hood as well as an 8gb RAM and a massive 128gb internal storage. This is an upgrade from last year's 4gb RAM and 64GB inbuilt storage. The Mi7 will also spot a near bezeless 5.8-inch full HD display and a dual rear camera setup of 16mp each. The battery has also received a massive upgrade from the 3360 mAh on the Mi 6 to a much more larger 4480 mAh. 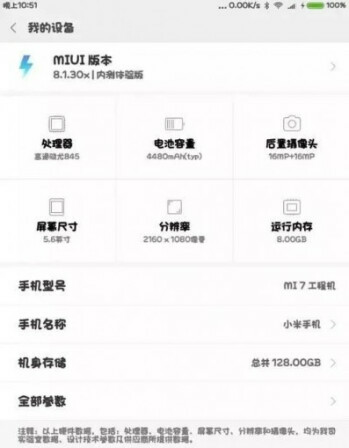 The current UI version on the leaked screenshot is MIUI 8.1.30x which means the build is from January 30th 2018. Nonetheless, the device is expected to run on Xiaomi's latest MIUI 9 when launched. Hmm, This is how they'll keep being exposed.